Sorry, I couldn’t resist the pun! I hope this post is a helpful guide to finding the mat of your dreams. 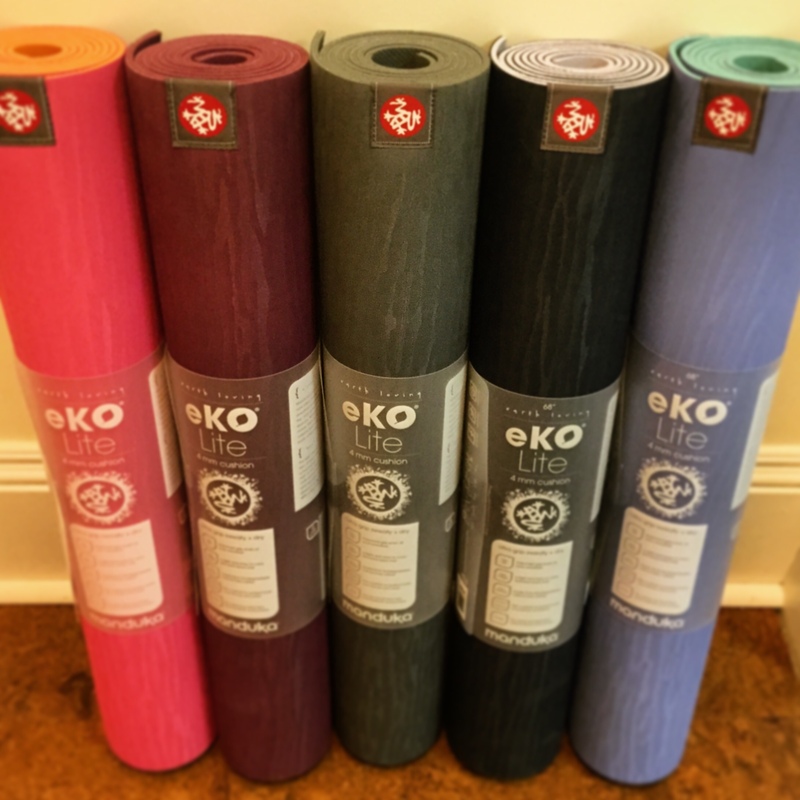 A quality yoga mat that suits your preferences can really enhance your practice. 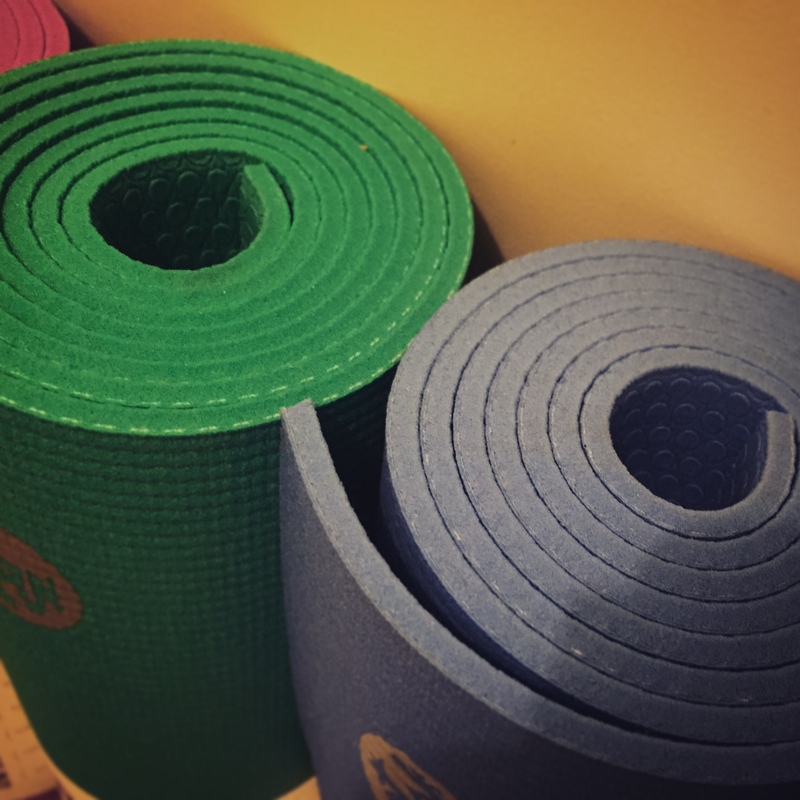 Ideally, if a mat is serving your needs, it should be functional and supportive enough that it becomes unnoticeable, so you can focus on enjoying your practice. We carry four different types of mats at QSY and choosing the mat that is most suitable for you is really up to personal preferences and priorities. 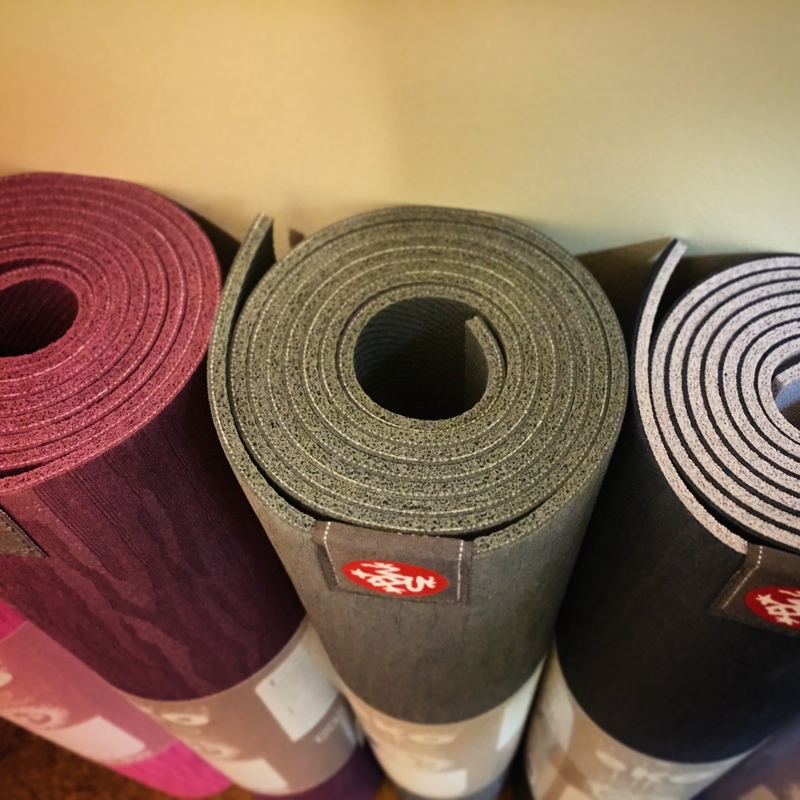 In this post, I’ll give what I consider to be the pros and cons of the mats we carry, so that if you’re in the market for a new mat, you can find one that feels like the best fit for your needs. This is our most affordable mat. It comes in some nice basic colors, and offers a fairly good grip. It’s light and portable at 2.4 lbs. The biggest downside to this mat, is that it’s thin and doesn’t offer a dense cushion for the knees or wrists. Another drawback is that that mat is made out of plastics, so some might consider it less environmentally friendly than a natural rubber. It will break down more quickly than our other mat, especially if you’re practicing quite frequently, so that’s another environmental drawback. I’d consider this a great starter mat, but it won’t offer great cushion or superior quality you might be looking for if you use your mat for frequent practice over several years. 2.4lbs and 4mm thick, with a low-density plastic (latex-free, phthalate-free PVC). This is a fairly thin, and low density mat. Won’t provide great cushion for those with any joint sensitivity. You may need to use a blanket to pad knees for example. Standard size (24″ x 72″) and also a wide version for those with broader shoulders. Might be slightly slippery at first due to manufacturing process, will get grippier with a wash or two and a bit of use. This mat may bunch and scoot around on the floor a bit (more than our 3 other options) with really active practice. New! We’re really excited to carry one of the newest mats on the market. B Yoga is a new Canadian company run by a group of women in Markham, Ontario. They’ve created a mat made of a blend of natural and synthetic rubbers, with superior grip to anything I’ve ever tried! They are soft to the touch, but there is no slipping on these mats, even in a sweaty flow practice. All B Mats are 26 inches wide (which is 2 inches more than standard) and this offers a little extra space to play and spread out. Another perk is that their mat has little to no smell compared to other rubber mats which can often have a strong rubbery smell. Lastly, these mats have a nice density and cushion (in the Everyday and Strong options). Slightly less dense in the cushion than a Manduka, but they also weigh in a little lower, so that’s a bonus if you’re carrying your mat around town a lot. $78+hst for the Everyday B Mat, $88+hst for the Strong and $48+hst for the Travel. 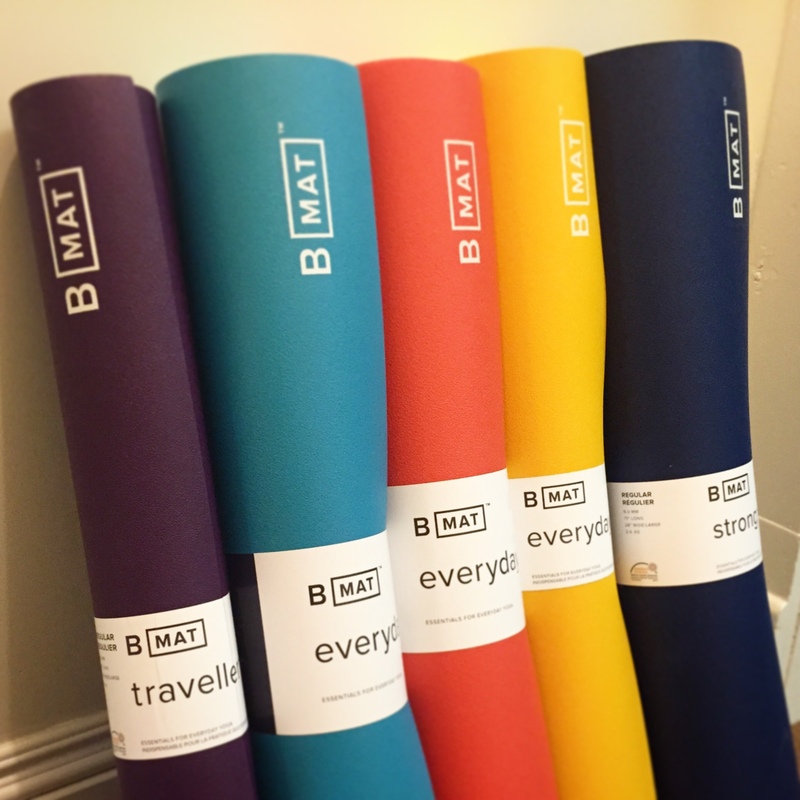 The B MAT comes in 3 thicknesses/weights depending on how much you value cushion: Travel (2mm, 2.4lbs), Everyday (4mm, 3.7lbs), and Strong (6mm, 5lbs). Each thickness comes in a standard length (71”) or a long version (85”). The surface texture of the B MAT™ will attract dust when you first start using it. This is related to B MAT™’s impressive grippy texture and the fact that they didn’t want to use any chemical additives to reduce this effect. The dust attraction will dissipate with use. Currently manufactured in Spain using environmentally friendly manufacturing (OEKO-TEX Certified Production for non-toxic emissions). Manufacturing is supposed to move to Canada soon. Not recommended if you have a latex allergy. This eco-friendly yoga mat is made from biodegradable, non-Amazon harvested, natural tree rubber. These natural rubber mats use a toxic-free softening process and are completely free of toxic foaming agents and plasticizers found in other mats, and making it one of the most eco-friendly mats on the market. It’s only 4mm, but the rubber is much denser and more supportive than the Studio Mat, and this mat boosts a great grip. The lightly rippled top surface features an innovative, sealed-cell natural rubber surface that creates a hygienic barrier and makes the mat grippy even in sweaty conditions, but also easy to clean. That being said, natural rubber mats do tend to attract lint and hair more than other mat materials. They may not be the best choice if you practice around a lot of pets! No break in period or pre-treating necessary, the mat should be grippy right away. The natural rubber gives off a rubbery smell for the first month or two of use. This does lessen over time, but never completely goes away. Constructed to stay put on the floor and not stretch, even in a very active practice. It achieves this fairly well. At 4.5lbs it’s not the lightest mat to carry to class, but it’s not bad considering the density and cushion you get. At 4mm and medium density, you may need to use a blanket for some postures, if you have sensitive joints. Durability is fairly good, but these mats will wear out over a number of years of heavy use. No life-time warranty like the Pro-Lite. With a life-time guarantee, this is the most durable mat on the market and a very eco-friendly option. It’s made in Germany with OekoTex certified, emissions-free manufacturing. The plastics they use are 100% latex free, and safe to use for people with latex sensitivities. 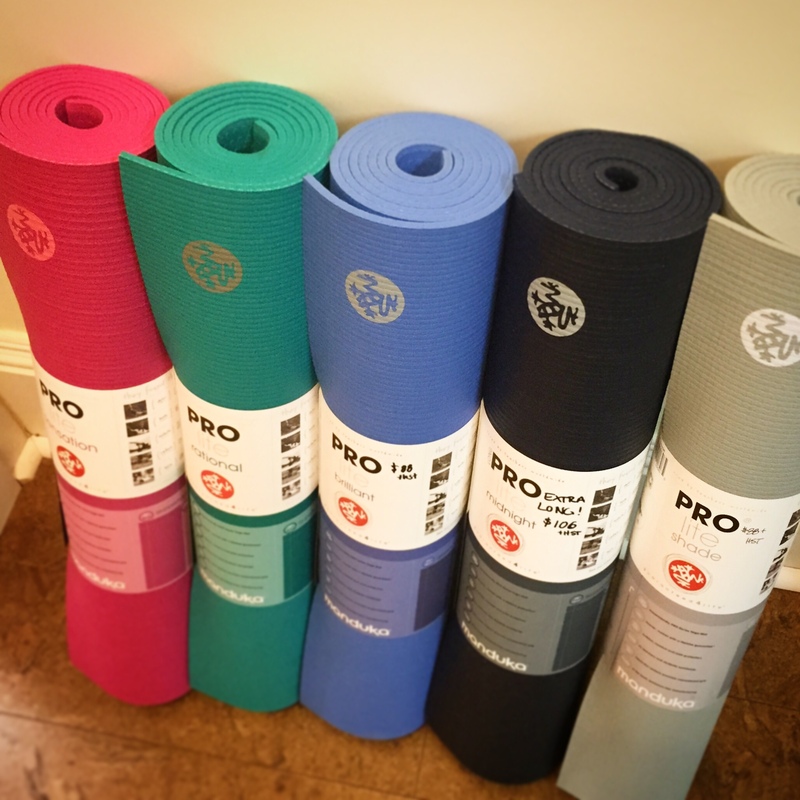 The Pro-Lite also provides the most density and cushion for sensitive joints of all our mats. A drawback to this mat is that is has a film the remains on the mat after manufacturing that can be quite slippery if you’re at all sweaty, and it takes significant break in period and some elbow grease for that film to wear off. Be prepared to vigorously scrub your mat with sea salt several times, and perhaps add a hand towel for sweaty practices. Superior density, cushion, and durability. Mat is 4.5mm thick and with very dense cushion. Environmentally friendly manufacturing (OEKO-TEX Certified Production for non-toxic emissions), and very durable materials. Life-time guarantee. Easy to clean. No smell. Latex-free. At 4lbs it’s not the lightest mat to carry to class, but it’s not bad considering the density and cushion you get. 71” long and 24” wide. Biggest drawback: Several-month break in period and some salt scrubs are needed for the mat to become less slippery. It will get grippier over time, but not as grippy as our other mats. If you sweat much in your practice you’ll need to add a hand towel or some sticky mat squares for your hands to stay put. Also available in wider, longer, and thicker versions. Some may need to be special ordered. 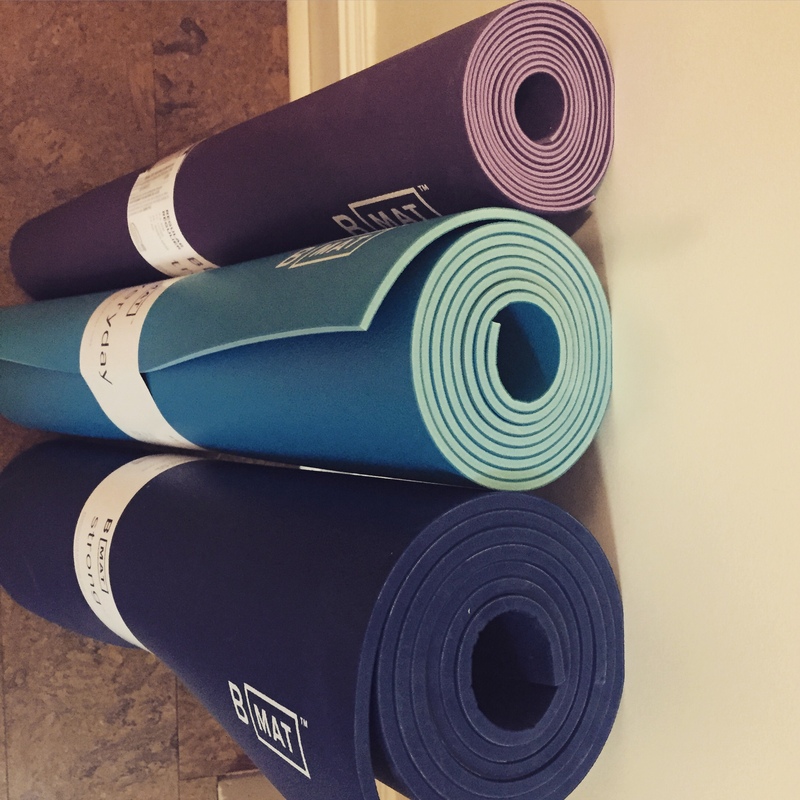 If you’re upgrading your mat, we are happy to accept donations of used mats for our Yoga in the Park and other community outreach programs. 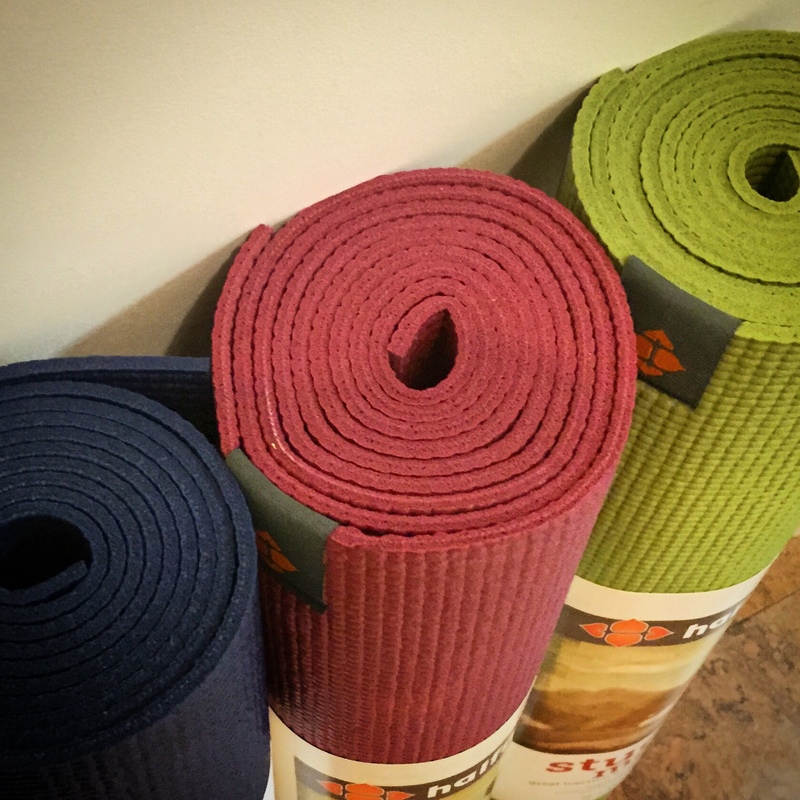 There are also lots of great ways to repurpose a mat that’s too worn out for yoga practice. Check out a list of 26 ideas here! 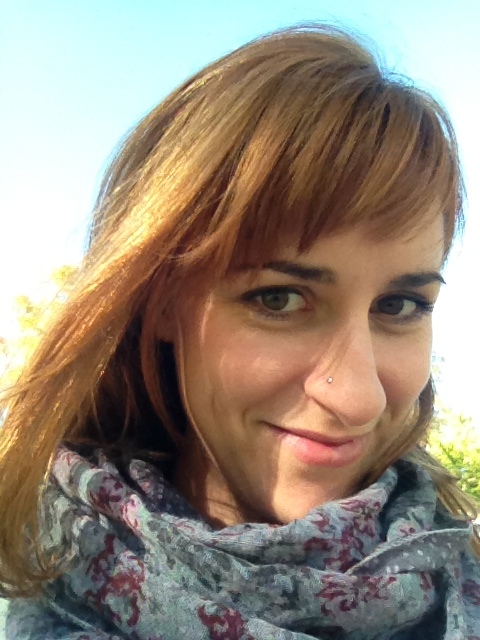 Leena Miller Cressman is the director of Queen Street Yoga. Right now she’s in love with practicing the Tensegrity Repair Series, handstands and doing gentle twists over her bolster. You’ll also find her cruising around on her rusty but trusty bike, and tending to her community garden plot full of arugula, kale, and basil.